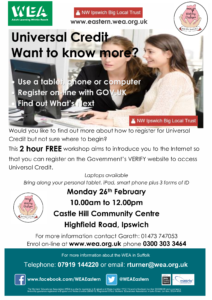 We are proud to host a computer training event here at the centre that is designed to help you apply for Universal Credit via the internet. Monday February 26th, 10 – 12noon. You will be welcome to bring your own tablet or phone and laptops will be available to use if needed. To register on the Universal Credit site you will need to bring some forms of ID (driving licence, passport, utility bill, etc).